The Pizza Press is an exciting new concept in pizzerias. Instead of just coming in and having a slice, you get to choose how you want your pizza and watch it be made right in front of you. Then our pizza chefs pop it in the oven until it is perfectly cooked. That’s how you publish a pizza at The Pizza Press! 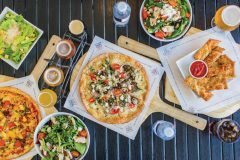 Visit one of our many California locations with your friends and family now to enjoy your new favorite pizza along with crisp, fresh salads, and a wide range of the finest craft beers. You won’t want to leave our newspaper-themed pizzerias once you’ve stepped foot inside! Come eat the best pizza you’ve ever had at one of The Pizza Press’s locations!